41mm 904L stainless steel case, screw-down steel back, screw-down crown with twinlock double waterproofness system, smooth bezel, scratch-resistant double anti-reflective sapphire crystal with cyclops lens over the date, black dial, index hour markers, Rolex calibre 3235 perpetual self-winding movement with date at 3 o'clock that changes instantaneously at midnight in a few thousandths of a second, approximately 70 hours of power reserve, 904L steel Jubilee bracelet with five-piece links, folding Oysterclasp buckle with Easylink 5mm comfort extension link. Waterproof to 100 meters. 41mm 904L stainless steel case, screw-down steel back, screw-down crown with twinlock double waterproofness system, smooth bezel, scratch-resistant double anti-reflective sapphire crystal with cyclops lens over the date, blue dial, index hour markers, Rolex calibre 3235 perpetual self-winding movement with date at 3 o'clock that changes instantaneously at midnight in a few thousandths of a second, approximately 70 hours of power reserve, 904L steel Jubilee bracelet with five-piece links, folding Oysterclasp buckle with Easylink 5mm comfort extension link. Waterproof to 100 meters. 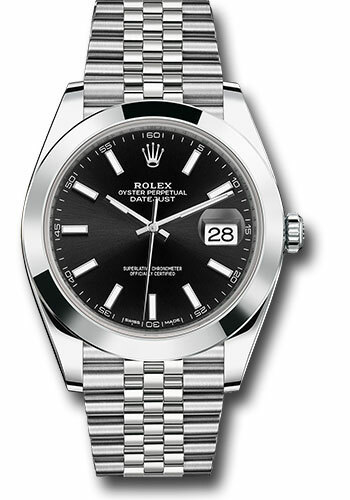 41mm 904L stainless steel case, screw-down steel back, screw-down crown with twinlock double waterproofness system, smooth bezel, scratch-resistant double anti-reflective sapphire crystal with cyclops lens over the date, dark rhodium dial, index hour markers, Rolex calibre 3235 perpetual self-winding movement with date at 3 o'clock that changes instantaneously at midnight in a few thousandths of a second, approximately 70 hours of power reserve, 904L steel Jubilee bracelet with five-piece links, folding Oysterclasp buckle with Easylink 5mm comfort extension link. Waterproof to 100 meters. 41mm 904L stainless steel case, screw-down steel back, screw-down crown with twinlock double waterproofness system, smooth bezel, scratch-resistant double anti-reflective sapphire crystal with cyclops lens over the date, silver dial, index hour markers, Rolex calibre 3235 perpetual self-winding movement with date at 3 o'clock that changes instantaneously at midnight in a few thousandths of a second, approximately 70 hours of power reserve, 904L steel Jubilee bracelet with five-piece links, folding Oysterclasp buckle with Easylink 5mm comfort extension link. Waterproof to 100 meters. 41mm 904L stainless steel case, screw-down steel back, screw-down crown with twinlock double waterproofness system, smooth bezel, scratch-resistant double anti-reflective sapphire crystal with cyclops lens over the date, slate dial, green Roman numerals, Rolex calibre 3235 perpetual self-winding movement with date at 3 o'clock that changes instantaneously at midnight in a few thousandths of a second, approximately 70 hours of power reserve, 904L steel Jubilee bracelet with five-piece links, folding Oysterclasp buckle with Easylink 5mm comfort extension link. Waterproof to 100 meters. 41mm 904L stainless steel case, screw-down steel back, screw-down crown with twinlock double waterproofness system, smooth bezel, scratch-resistant double anti-reflective sapphire crystal with cyclops lens over the date, white dial, index hour markers, Rolex calibre 3235 perpetual self-winding movement with date at 3 o'clock that changes instantaneously at midnight in a few thousandths of a second, approximately 70 hours of power reserve, 904L steel Jubilee bracelet with five-piece links, folding Oysterclasp buckle with Easylink 5mm comfort extension link. Waterproof to 100 meters.